← Pirate Kart, hacked site, pixexix for mac and more! I’ll be honest, this price was pretty much a filler price, I wanted something that wasn’t over the regular price but not far from it. and $6.66 is a fun price (a large part of my motivations for stuff in this sale was just to have fun!). Not many sales today, as I expected, people knew the price would drop again later. BOOM! 75% OFF, right in your face, early in the week! When people talk about sales I hear that this discount is the golden number, and that’s why you’ll see it so much during steam’s holiday sales. I figured why not!? This week is nothing if not an opportunity to experiment, and this sale certainly sold a very healthy amount more than Monday’s 50% off, and was the day with the 2nd highest copies sold. This price was mostly just to let people know that I wasn’t afraid to charge more than the usual price for the game, a fun idea, but not a smart one, right? WRONG! 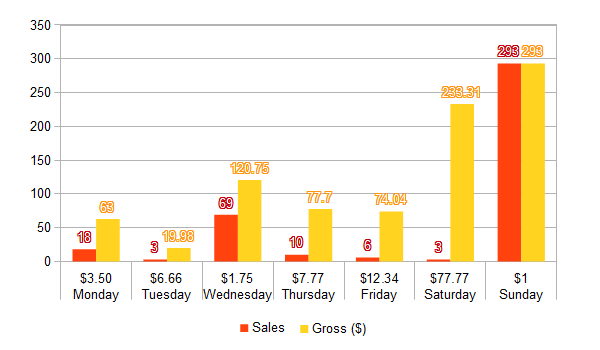 not an amazing number of sales this day, but certainly enough to make more money than Monday, and over half as much as Wednesday’s sale. Whee, shoot past the $10 mark! nobody saw it coming, but I had a lot of people telling me, even before the sale they wanted to pay extra for this game, and I am not one to turn down the offer of support. plus, RAISING PRICES DURING A SALE IS FUNNY! sold less than Thursday here, but almost made the same amount of money. yep, one dollar, by the end I think everyone saw it coming, and it came. I think the results weren’t really unexpected either, a ton of sales. Though I admit wasn’t sure if this day would be more profitable than Saturday until the final hour or so. So then, the quick-mathed of you will have already counted up that this week I sold 402 copies and the total gross income (before fastspring’s cut, before tax etc) is $881.03. Thanks for sharing, there some interesting stuff in there, even if the figures are low. Not bad. Overall I’d say your strange price changing idea was a success. Especially on saturday..
Congratulations for both the game and the sale and thanks for sharing those stats. Also, do keep it up! Hey Sophie, I’m really glad that the sale has been a success. These are really interesting figures, and the indie world needs to work out how much they should be charging for games (or any media in fact). The most impressive figure is the overall sales, it shows that sales work (steam knows this!) and that you will make money if you simply say something is on sale (also it adds to the marketing). Anyway, good luck for the future! 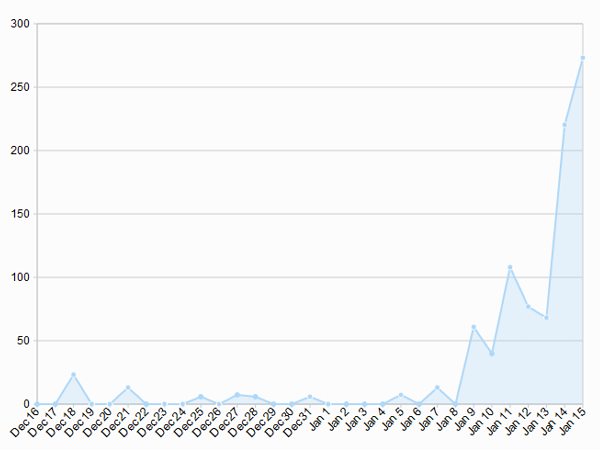 Hey, do you have any info on the web traffic for game, I might be interesting to see the traffic vs sales. This information is priceless and fascinating. My friends and I have found that lowering our prices usually hurts us. Maybe I should charge $100.00 for my games and I could make more money! Interesting post Sophie, thanks for sharing! I guessed wrong: I had thought that on Sunday, it would be name-the-price. I can’t help but think that “$1 or more” would have netted you more than just “$1” (I ended up waiting for Monday). I don’t think higher net is a guarantee, though. There are certainly people who would pay $1 when it’s the current price, but feel uncomfortable paying $1 when they could pay more. If you wanted to do name-the-price, you might consider having a little micro-sale beforehand (say, $1 during the witching hour GMT of Friday the 13th) to set the expectation that yes, you’re OK letting the game go for $1 (but pay what you want). Re: Thomas: I believe it was featured on TIGSource on Wednesday, so it’s probably fortunate that lined up with a heavy discount. Indiegames.com featured it Tuesday and then a couple more times later in the week, which didn’t seem to have much effect. Thats right, when i go to indievania and see game for 1$ i have no problem with impulsive purchase, but when game price is 3-5$ i ask myself “will you really play this?”. If game costs even more i think “maybe i should wait it in some bundle?”.